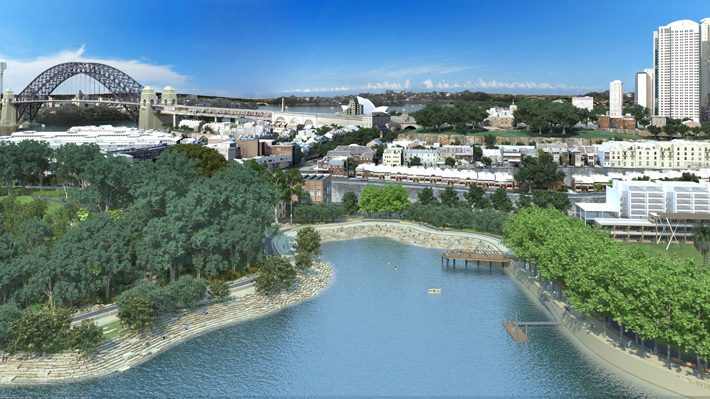 PWP led the design team to re-create a historic headland on an abandoned dock in Sydney Harbor. The headland was a “Club Cape,” a bluff gradually rising from the north and culminating in a steep cliff-like face at the south. The new headland is distinguished from its historic model by incorporating an underground cultural center and a public garage accessed by an elevator discretely located at the highest point of the headland. A shoreline walk provides major public access; it features pedestrian and bicycle pathways separated by a sandstone wall that follows the 1836 shore edge. 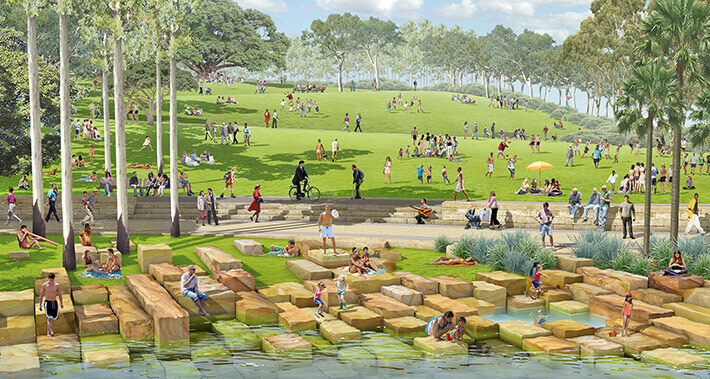 Extracted on the site, large blocks of sandstone —a material that references both the topography and the building material of early Sydney—will mark the edges of the harbor with tidal pools. Plantings are specific not just to Australia but to Sydney and include a replicated bush landscape with large specimen trees. 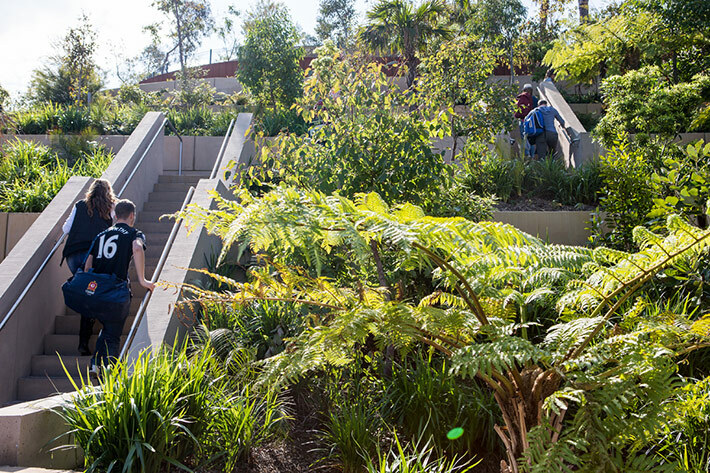 The result is a park that unites cultural references with natural processes. Water-jetting, which “weathers” surfaces in a naturalistic way, shapes and softens the layered stone. 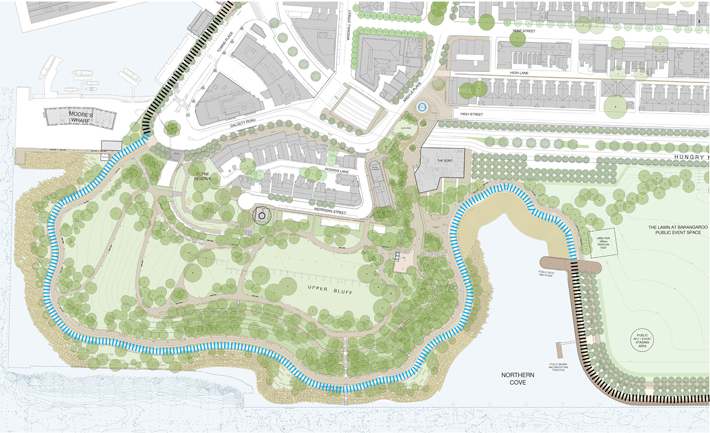 A series of preliminary prototypes have been used to develop guidelines for the stone installation, and a series of detail models explore and demonstrate these shoreline opportunities. The average quarried blocks are 750 millimeters high, 1,500 millimeters wide, and 2,500 to 5,000 millimeters long. They are placed in side-by-side cascades to create intimate stepped areas where people can explore the tidal zone and bolder outcroppings for more adventurous play. 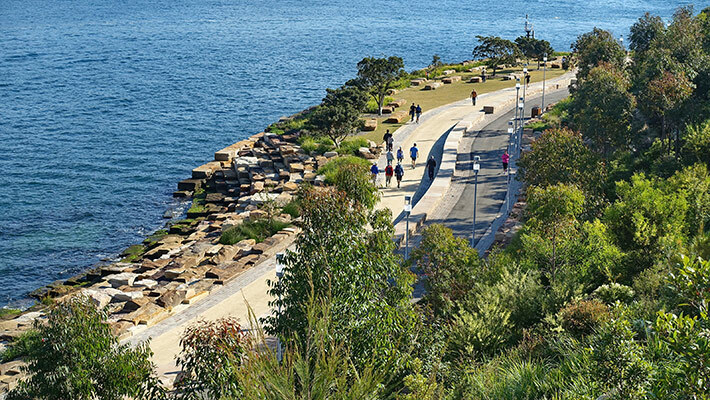 The Foreshore Promenade in Barangaroo Reserve runs along the harbor from the entry at Towns Place to Hickson Road and continues into Barangaroo Central. 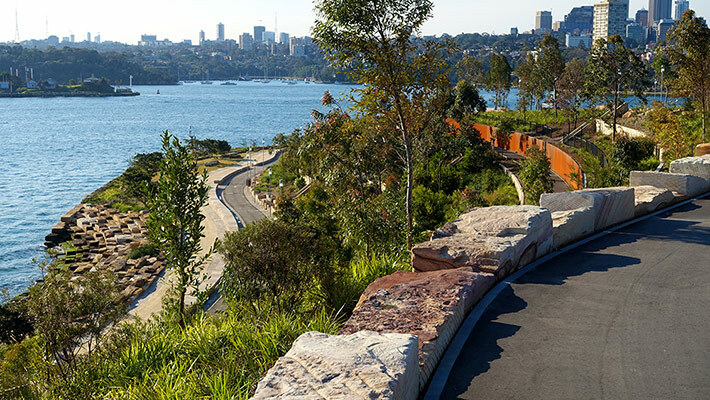 A stone wall runs along the Barangaroo Reserve Foreshore Promenade, which marks the historic 1836 foreshore edge. 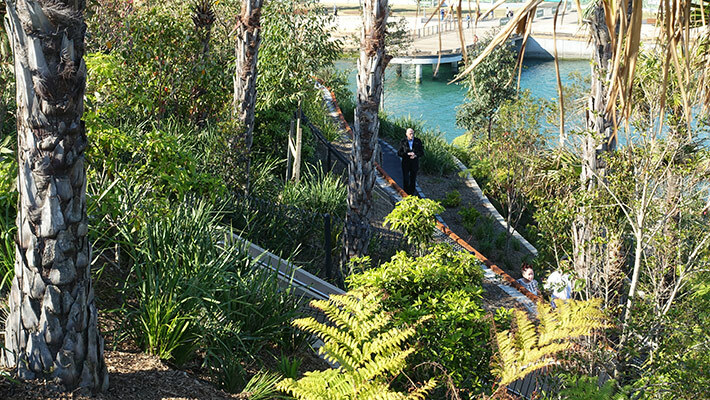 By contrast, the intimately shaded Bush Walk runs up-slope from the Foreshore Promenade. It begins at Argyle Place and terminates at the Upper Bluff Lawn with dramatic views of the Harbor. The Upper Bluff - the highest point of Headland Park - gently slopes to the north and offers space for passive recreation. Although the experience shifts from the intimacy of the Bush Walk to an open clearing, the bush canopy is woven into the Upper Bluff through clusters of large fig trees and eucalyptus, providing shade on the upper lawn. The bush is the most complex ecology in the Headland Park. 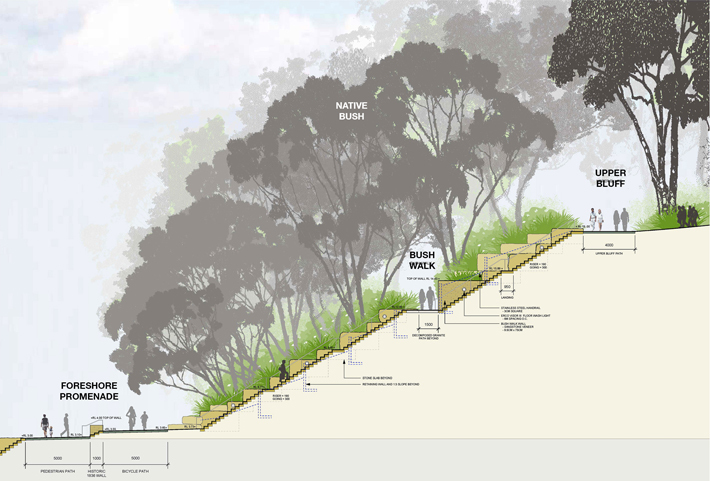 It consists of three separate layers: 1) a ground-plane layer of plants from about 1/2 meter to 2 meters in height; 2) an understory of plants up to approximately 5 meters in height that gives the headland the distinctive shape of existing Sydney headlands; and 3) canopy layers of trees 10 to 20 meters in height that forms a series of cathedral-like spaces above the bush planting layers. 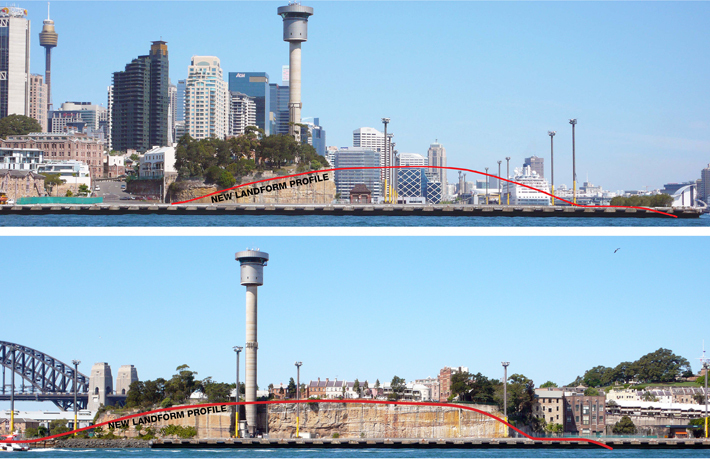 The Northern Cove separates Barangaroo Reserve from Barangaroo Central and the Urban District. It gives shape to the shoreline and creates opportunities for harbor views close to Hickson Boulevard. Thin slabs of sandstone arranged like shingles gently slope through the tidal zone and transition into slabs of terraced sandstone that create broad seat-high steps. 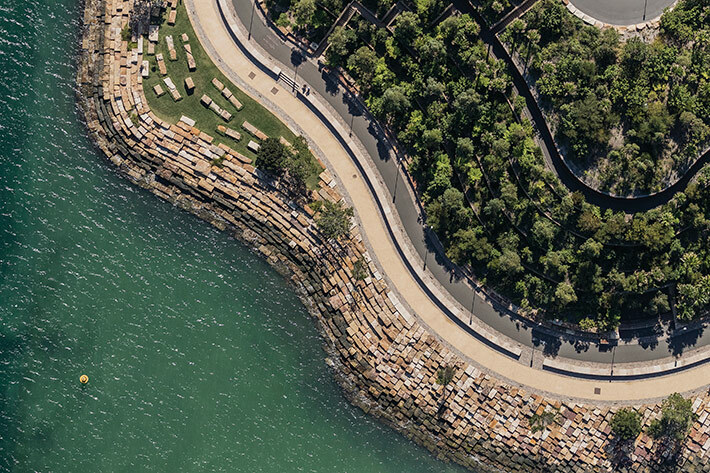 A grove of canopy trees at the entrance of the park from Hickson Road into the Northern Cove creates a civic space unifying the two sides - Barangaroo Reserve Foreshore Promenade to the right and Barangaroo Central Promenade to the left. 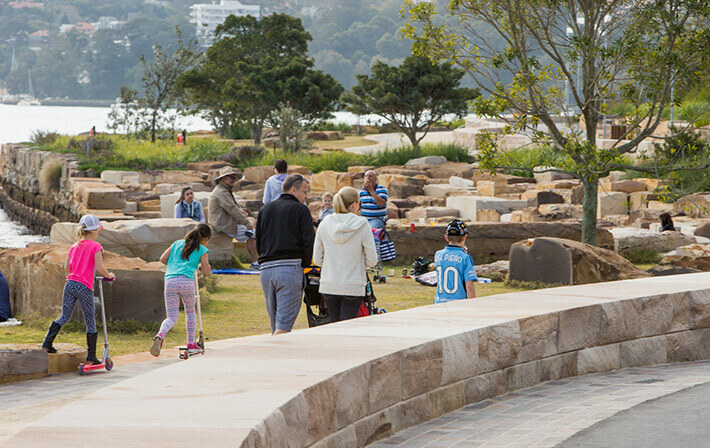 The main entrance to Barangaroo Headland Park at Towns Place will function as a drop-off and parking area for the park; the second entry-Argyle Place-the heart of the historic Millers Point neighborhood will provide an entrance that is also a revitalized town square. Pre-industrial photographs indicate that the neighborhood had fine-grained streets and laneways. The highlighted section above was demolished to make room for industrialization in the 1920’s.Towns Place was a bustling waterfront with many buildings, and Argyle Place was surrounded by colonial structures. The demolition resulted in wide streets and narrow pedestrian paths with few trees and amenities. In order to reverse the industrial past, the new plan widens pedestrian zones provides trees, furniture, and amenities so that people can walk and gather comfortably.